Watson Lake is a small town in the Yukon, not far from the British Columbia border. It’s a small town with a population under 1000. Most people make their money in the lumber industry and it sits on the Alaska Highway, a rest stop for people making pilgrimage to Alaska. It’s a quaint town with a long history and it’s the last place you’d expect to have a famous roadside attraction that sees thousands of visitors every year. Watson Lake is home to the Sign Post Forest, a collection of local and international sign posts that have grown from one sign pointing to Illinois to literally an entire forest of signposts. You’ve probably seen the signpost trees in towns like Halifax, Philipsburg, and other places around the world. Signs that point to the direction of famous cities and state their distance. Well, Watson Lake has a forest of these posts numbering over 100,000. The Sign Post Forest began in 1942, when a homesick American GI working with the 341st Engineers was ordered to repair a broken sign post. It was a simple job, one that was frequently needed as heavy-duty machinery used roads built for much smaller vehicles. But this particular GI was homesick for his hometown of Danville, Illinois. So, instead of simply fixing the sign, the GI personalized it, putting an extra sign pointing to Danville and stating its distance. Several other people thought this was a good idea and added their hometowns to the sign. Soon, the idea snowballed into what it is today: a forest of signs pointing to nearly every conceivable place on the planet. In 1942, the Sign Post Forest was a small idea, now it spans two acres, comprising of over 100,000 items ranging from street signs to welcome signs, signatures on dinner plates, and international license plates. Ranging from quirky to seintimental, the Sign Post Forest reflects the town’s daily visitors: people travelling through from different parts, catching a small glimpse into Canada’s most remote areas. What makes the Sign Post Forest is not its idea, which is one adopted around the world, but its age, method, and adoption by other people. It’s more than a collection of objects, it’s a part of what makes Watson Lake unique. An isolated area where people are prone to homesickness, the Sign Post Forest is an example of how a small, seemingly insignificant place is genuinely connected to the rest of the world. The idea is organic as well, a collection of things from people who want to participate in this small town’s unique art project, and it reflects how Watson Lake itself is a welcoming town despite its location and relative isolation. Watson Lake’s Sign Post Forest is visited by thousands every year despite its remoteness, which makes its art project that much more important for its residents. The signs may point to other places, but they show how everything is really no too far. Imagine you live in a small town with limited resources but lots of character. You have old buildings that need a bit of sprucing up or entire streets that are wearing their age on their sleeves. The town looks like it’s on the cusp of being beautiful and it just needs an extra push to get that look it once had. With some extra life added to the town, you could attract new visitors, maybe even some new residents, and get some fresh blood into your home so more people can share in what makes your town so special. Walldogs is a business and art collective that’s dedicated to that exact problem. Coming from all over the world, the Walldogs descend on a town for a short time and blitz a whole bunch of new murals for a town. They take old buildings and give them new life and, in turn, can help towns revitalize and start on a new path with a new look. Think of it as a new haircut but for an entire town, and it’s been a very popular service all over North America. Here’s how it works: A town that wants to liven up their look contacts Walldogs. Walldogs sets them up with a project coordinator and event host who work with the city to decide on the murals, where the murals will be, and how many the town wants. The Walldogs then supply all the paints while the town itself supplies the other necessary materials. Then, over the course of a few days, the Walldogs come into the town, enlist local volunteers to help, and paint all the murals. Some towns turn the event into a festival of sorts, bringing in music and entertainment to help drum up support and excitement for the event. Then when it’s all said and done, the Walldogs leave and the town has a new set of murals for everyone to enjoy. The Walldogs is a for-profit service but one that helps bring towns together and, compared to other revitalization methods, is incredibly inexpensive. Unlike some plans, which involve long construction, delays, and often times imported labour that divides a town rather than unites it, the Walldogs is about the community itself. The murals are designed with the town’s history at heart and people are encouraged to join in on the fun. The Walldogs themselves seem to welcome anyone that’s willing to “show up to an event with a brush in hand and jump in.” By uniting the population through art, and by using experienced painters as project leads, Walldogs can bring an entire town together and give it a new lease on life. The Walldogs themselves are an art collective that are all passionate about murals and street art. Most of them own their own sign shops and do Walldogs as a special side project. The movement is now over 20 years old, with dozens of towns reaping the benefits. So if you live in a small town that may need some sprucing up, consider street art and consider the Walldogs. Despite being one of the world’s fastest growing economies, Brazil still struggles with poverty. Many of the biggest cities in the country are surrounded and embedded with favelas, another word for slums, that are home to millions of people. These favelas suffer from problems all too familiar for poor neighbourhoods: violence, lack of access to services, forced migration, and more, but they are also home to blossoming cultural movements, distinct artistic qualities, and hope. People now travel to Brazil to explore everything the country has to offer, including the favelas, and Dutch artists were just two of these people. The difference is these artists stuck around to help the community through involvement. Jeroen Koolhaas and Dre Urhahn, collectively known as Haas&Hahn, visited Brazil in 2005 to shoot a movie about favela hip-hop culture. Haas&Hahn were fascinated by the culture, art, and especially the people themselves, so they decided to give back to the communities that hosted their filming in a unique way: mural art. A great project for a section of Brazilian culture people seem intent on covering up. The favelas have come under increased skepticism and persecution over the past decade, especially as Brazil geared up to host the FIFA World Cup this year. Programs to cover up, quite literally, the slums for a good face on the international stage have been in place since 2009. Originally designed to curb the growth, especially since favelas have been growing at a rate larger than the cities to which they are attached, many detractors of the walls also noted they did a pretty good job of blocking them from view. Many pointed to the upcoming soccer tournament, but others speculate that favelas also lower housing prices. In a country with severe economic disparity, the solution for some of the elite is to simply not address the problem. Unfortunately, the problem accounts for over 6% of Brazil’s population, is growing steadily, and getting international attention. For a part of Brazilian culture that is literally being covered up, mural art gives some colour and attention to these famously eclectic districts and the people that live there. Before travelling to Brazil, Haas&Hahn had a history of big projects, painting entire buildings with murals that fit with the local culture and brought some flavour to neighbourhoods. But this was mostly in their native Netherlands and Europe. Brazil was a little bit different. As much as favelas have a blossoming culture, they also have very real problems. Drug lords can run entire favelas, where they use the youth as armed muscle they affectionately call “soldados.” Getting into a favela can be dangerous and difficult. Doing something other than looking can cost you your life without the right permissions. So Haas&Hahn had to win over the people and the resident drug lords in their fight, which may be in part why only 3 such projects happened. But permission was and is the name of the game with Haas&Hahn. Each project required permission from the residents of the favela and the people whose homes they would be painting. Designs were kept loose so residents could have an input in the colours and anyone who didn’t want to participate had their wishes respected. Since 2007, Haas&Hahn have done a total of three favela painting projects in Rio de Janeiro, each with their own flavour and direction. The first, “Boy with Kite,” is a smaller and more conventional mural. The mural is essentially its namesake, but the kite itself is nonexistent. Instead, a boy with a string looks out past the blue sky of the mural and towards the rest of the city, drawing the eye way from the mural and towards the favela itself. Rather than cover it up or try and distract from the slum, “Boy with Kite” encourages the viewer to see the surroundings. The second project is substantially more ambitious, tackling a series of stairs that lead up the hill of a favela Vila Cruzeiro, one of Brazil’s most dangerous and most populated slums, with an estimated population of between 40 000 and 70 000 inhabitants. Rio is a particularly hilly area of the world and the Vila Cruzeiro has a network of steps that lead all over its maze of streets, alleys, and walkways. For their second project, Haas&Hahn recruited local youth to turn one of these sets of stairs, and accompanying drainage pipes, into a cascading river of koi fish. Called “Rio Cruzeiro,” the project is substantially larger than “Boy with Kite” and incorporates the often fluid feel of a favela, which is often built without proper zoning or building codes, giving them a haphazard feel. The most Haas&Hahn favela painting project Haas&Hahn was “Praca Cantao,” a full-scale mural project that painted the houses of an entire square. Painted with vibrant colours often associated with the favelas, the Praca Cantao square boats a vibrancy seen in the city’s energy and citizens, but not often in their actual homes. 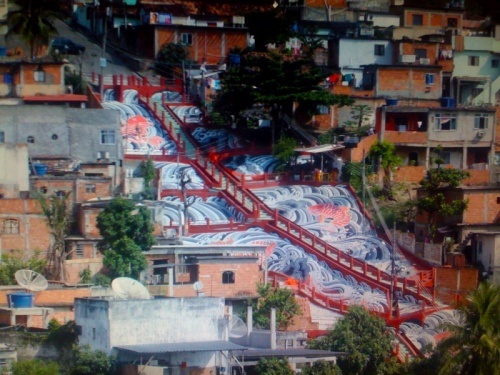 But the key part of the favela paintings is possible not even the art itself, but the community involvement. The artists worked with local youth to give them hands-on painting skills and experience, something many have put on their resume to find employment away from their drug-controlled neighbourhoods. Rather than simply do something they perceive as nice for a group of people, Haas&Hahn got involved, worked together with the people, and left them with something to look at but also some skills to move forward. Since Brazil, Haas&Hahn moved to slums a little closer to home, Philadelphia, where the poverty level is 167% above the national average. There, the murals have gotten even bigger stretching over 50 storefronts on two blocks. Organized with MuralArts, a program we’ve talked about before, Haas&Hahn’s murals continue to give a city once famous for smokestacks and steel production a new look. Other projects have also popped up in New York, Miami, and the Shenzhen Biennale in China. As for what’s next, Haas&Hahn raised over $100,000 to realize their dream project, painting an entire favela, on Kickstarter last year. They are currently scouting locations, deciding to start after the World Cup ended. By the time French street artist was featured in Banksy’s Exit Through the Gift Shop in 2010, he had already done his first solo art show in Hong Kong, defined the French street art scene, and almost been run over by a train. That last incident was how he got his name. After all, it was the Zeus train that nearly hit him while he was painting inside a train tunnel and decided that such a close brush with death should be remembered, and no moment should be wasted. And no one would accuse Zevs of squandering his life. He’s probably one of France’s most important art figures, one that never shies away from the deeply political. Many of the artists we’ve featured here at MuralForm have gone from tagging trains or walls to art galleries and Zevs is no exception. Bridging the gap between the “high” art world and the “low,” street-level art, some would argue, has been accomplished. Banksy sells pieces in galleries for small fortunes. Shepard Fairey has turned his most iconic pieces into gallery art, and subsequently turned them into recognizable and profitable pieces seen everywhere for backpacks to campaign posters. Some even crossed over to advertising for some of the biggest companies in the world. But Zevs, he’s happier discrediting the corporate world while still pushing the boundaries of street art. Zevs started out in Paris in the 1990s tagging anywhere he could, but two ongoing projects in particular caught the attention of the public. One, called Shadows, painted fixed shadows of various objects on the ground. Everything from park benches to wastebaskets were given permanent(ish) imprints on the ground or nearby walls. The work showed that street art wasn’t limited to walls, but could traverse other surfaces as well, a point Banksy would pick up in a few short years. His other major project, Visual Attacks, targets billboards in France, to this day spraking a debate on whether he’s a vandal or artist. Zevs would write alternate slogans on the advertisements and paint bloodied eyes on the models, disrupting the marketing with disturbing images and words. Visual attacks attacks commercialism exactly where it’s most prominently seen: advertising billboards. Zevs continued to target commercialism and major corporations in the mid-2000s with Liquidated Logos. 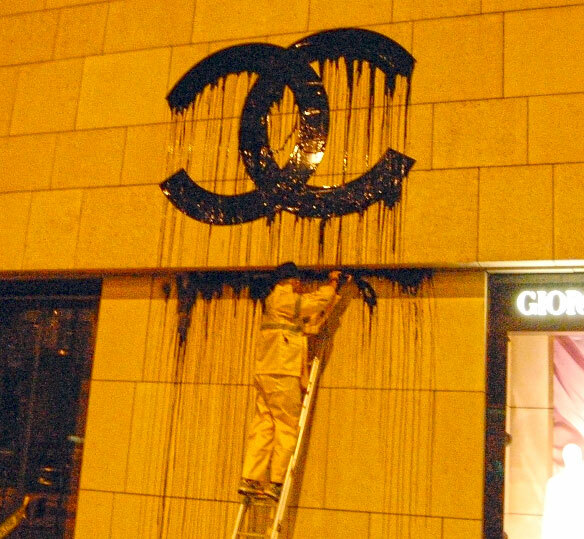 The project takes corporate logos and drips paint from them, giving the illusion that these logos are dissolving. The project speaks to the ever-presence of logos but their non-tangible existence, undermining their constant appearance in the street, on the screen, and at home. Zevs art continually challenges the distinction between vandalism, street, and high art, incorporating postmodern styles and aesthetics into his artwork to push these boundaries even further. While most would condemn much of his street-level artwork for its intrusion, the very openness of Zevs’ art speaks to the constant intrusion of marketing as being unnecessarily encouraged and sanctioned by the government. His politics and prominence in Europe has let him move to art galleries, but Zevs seems continually uncomfortable with the art we’re forced to consume everyday. Street Art And Social Media: Similar But Different? In a world where street art gets painted over and washed away as quick as it’s drawn, many street artists are turning to social media to archive their projects and, at the same time, increase their exposure. We all know social media sites like Facebook and Instagram are permanently marking our lives, turning every picture and event into a searchable database. It can be fun to see pictures from years ago and see how we’ve changed, but it can also be a great way to get people excited about different art projects, and especially street art. Artists like Jay Shells have been using social media to preserve their art after it’s been washed away, but is social media just a tool for street artists, or are they already social media mavericks? When you look many street artists’ work, it purposefully injects viewers into the project. It’s designed to turn heads, make people talk, and convey a message. The same can be said about art in galleries or installed in people’s homes, however, so what makes street art a more social form of art and media? Some argue it’s street art’s baseline interactivity and use of public space, it’s very origins as vandalism as a means to encourage participation and interactivity. At it’s most basic form, street art is paint on a surface in a public forum, be it a building wall, billboard, public transit vehicle, or other similar medium. It’s left out for others to see and uses the space on which it’s used as a part of it’s picture and message. Take Zevs’ controversial Visual Attack series for example. Each piece uses existing advertisements to change the message on billboards by adding paint to the project. It interacts and encourages participation. In that way, street art can become social media. And the level needed to participate is arguably lower than that of traditional social media. For example, Instagram requires some of the following: a smartphone with a camera, internet access, and a membership to the app. An original Banksy painted on the side of a house in Bristol requires walking down the street in Bristol. Theoretically, if you already live in Bristol, the threshold for becoming part of the Banksy audience and community is much lower, not barring people based on their ability to access technology and internet, but their ability to walk down a street. Street art breaks the boundary between vandalism and art to comment on many different aspects of our everyday lives, but billboards in particular. Billboards are a particular form of street art that has special protections for one simple reason: it has been paid for. They are unique only in their protection while street art is continually washed away and scrubbed from our streets at a great cost to the city. Naturally, the boundary between lewd graffiti, street art, and billboards is porous but always discussed, but only one of these is legally allowed to stay up. Street artists use these spaces to their advantage and, by doing so, challenge why special provisions are given to corporate street art over other forms of public art. http://muralform.com/wp-content/uploads/2014/11/social-media-art.jpg 400 880 Zachary Edwards http://muralform.com/wp-content/uploads/2014/02/muralform-logo-2-300x137.png Zachary Edwards2014-11-12 19:10:572014-11-12 19:11:30Street Art And Social Media: Similar But Different? Geography has always played an important part in hip-hop and rap culture. Where you’re from is important. It could connect you with like-minded people. It could get you killed. Dropping lyrics about where you’re from is a way of saying who you are, where you started, and how far you’ve come. NYC-based artist Jason Shelowitz, a.k.a. Jay Shells, understands the important of place in hip-hop, so he’s taken the lyrics to where they started. Taking the form of red street signs, Jay Shells’ “Rap Quotes” puts shout-outs about specific places exactly where they came from. One sign in Stapleton House Village, for example, has lyrics by RZA: “Grew up in Stapleton House Village, where blood flood the waters in the streets like oil spillage.” Up on Broadway and Myrtle, a sign quotes Mos Def. A street post near Carnegie Hall sports lyrics by Busta Rhymes. Slowly but surely, Jay Shells’ signs are popping up all over NYC. Since the signs themselves mimic official street signs, the very medium of “Rap Quotes” delves into the rebellious and anti-authority sentiments found in much of the hip-hop Jay Shells quotes. The project is less about praising these areas and more giving a visual history to a largely auditory medium. Cam’ron’s lyrics about 145th and Broadway speak directly about the violence he experienced in that area. Since the East-West Coast is rivalry largely over, Shells had no problem finding some help for “Rap Quotes,” from helping put up the signs, comb rap lyrics for the perfect quotes, and snap some photos so the signs are immortalized in proper place before the signs are taken down by fans, detractors, or the authorities. Since posting street signs without a permit is illegal pretty much everywhere, Jay Shells is used to seeing his work taken down. But these days, the authorities are the last people to take them down, because fans and detractors usually get to them first. In Harlem, for example, Jay Shells and his colleagues watched from across the street as a freshly installed sign quoting Sadat X was removed. Jay Shells seems unfazed by the entire removal process “He removed the sign and threw it in the trash,” he said in a recent interview, “You can’t please em all.” But despite his laissez-faire attitude about the signs getting removed, he does try and preserve the sentiment on his Twitter (@TheRapQuotes) and by taking the signs off the streets and into galleries. The most recent gallery to showcase Jay Shells “Rap Quotes,” along with some of his other art projects, is Gallery 1988. Jay Shells hopes to expand the project outwards to other American cities and galleries, taking his subversive work, quite literally, to the streets across America. New York, while not as aggressive as L.A. in its anti-graffiti laws, has made it purposefully difficult for people to make street art and have it stay. NYC has set up an anti-graffiti taskforce whose sole job is to go around the Five Boroughs and paint over street art. Sure, some of that may need to be removed, either because it’s unwelcome or offensive, but many of NYC’s greatest street artists have their great work eradicated before people can really appreciate it. That’s why this street mural is such a curiosity. To the average person with little to no knowledge of the New York graffiti scene, this mural on Allen and Division Streets in Chinatown is just another instance of tagging. Another place where people with spray cans have vandalized a piece of property with territorial markings. But for someone who knows the New York street art scene, this is a pretty cool collaborative effort, and perhaps the beginning of something new. First, you may notice some pretty famous names on here: Remo, SP, Joz, Easy, Mey, Cinik, Sev, Giz, 17, Chino, Veefer, and Trap are all represented in the tags. These aren’t just some guys with spray paint, these are respected artists. And the end result looks like normal graffiti, the usual tagging people sometimes simply tolerate in their neighbourhoods, but speaks to the history and importance of street art in a city’s aesthetic and visual history. The other important part of this piece is it’s legal status, in other words, the fact that it isn’t vandalism next of the chopping block for buffing out. Nope, this is fully legal street art, created in partnership with the City of New York. The graffiti collective Animal previously managed to get a mural done in Chinatown, but it took three years of paperwork and the help of a community affairs officer in the 5th precinct to get it done. Here, we expect the same process happened, but this is less overtly a pice of mural art and more a collection of names. Either way, things seem to be changing in NYC for graffiti artists. They are certainly changing elsewhere in the country. Take, for example, Saber and Zeser’s L.A. mural. For a town with actual legislation against murals, their legal mural for a downtown artstore is an accomplishment simply by its existence. But it’s materials is even more interesting: it uses materials that are used to buff and eradicate mural art. Rollers, fire extinguishers, and other items used that are either directly used or simulate the poor quality paint used to erase graffiti are all used. The result is a stunning visual piece that speaks to the importance of mural art while using the very procedures that keep it somewhat concealed or censored. Even its height, only using the top half of the building, speak to the NYC taskforce’s limited resources in removing higher street art. Both of these murals stand as testaments to the importance of street art and its gradual reclamation of acceptance and recognition. Both of these cities at one time were almost defined by their graffiti and street art, for better or worse, and both cities have actively attempted to erase that part of their visual history and aesthetic. But with these two murals, that aspect of history is both reclaimed and deemed by the higher authorities as appropriate and necessary. That counts as a win for both.